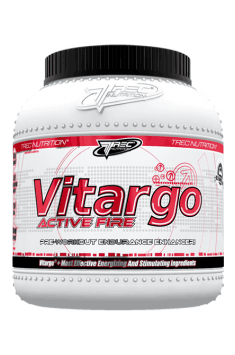 VITARGO ACTIVE FIRE is a pre-training stack based on the patented Vitargo® formula. It contains the most effective energizing and stimulating ingredients which help you maximize your body’s potential during intensive and prolonged exercise. The product has been supplemented with Vinitrox® in order to enhance the transport of carbohydrates, branched-chain amino acids (BCAA), creatine and oxygen contained in the product to the working muscles. VITARGO ACTIVE FIRE will boost your energy, concentration and motivation for training, and help you take your exercise to a higher intensity level in all sports disciplines. Regardless of the sports discipline you practise, your muscles contract and relax due to millions of metabolic reactions which keep the human body in constant movement. It is forced to produce massive amounts of energy in very short periods of time. In order to maintain training intensity, it is very important to prepare for training appropriately. You know that you can’t train without a warm-up, but do you fill up on the components responsible for energy production before training? How can you provide your body with the necessary nutrients without burdening the stomach and digestion tract? Do you know which elements to take, in what proportions and when you should take them to ensure uninterrupted training and the proper outcomes? Don’t worry! TREC NUTRITION’s team of experts have designed a product especially for you! VITARGO ACTIVE FIRE is a completely new pre-training formula, which contains the most important nutrients necessary for maintaining high levels of endurance, fitness and maximum concentration during professional training. The product’s innovative formula is based on the best energy-providing and regulating components in optimum doses. VITARGO ACTIVE FIRE is a source of complex yet easily absorbable carbohydrates obtained in 100% from VITARGO®. Thanks to these unique physical and chemical features, these substances do not remain in the stomach, and are immediately absorbed through the digestion tract. VITARGO® leaves the stomach 130% faster than dextrose and maltodextrin, so the process of initial digestion does not slow you down. Thanks to VITARGO®, your muscles are immediately supplied with easily-released stable glucose, which is incomparable with other simple and complex carbohydrates. Forget about nausea and stomach discomfort, VITARGO ACTIVE FIRE makes training pure pleasure! VITARGO ACTIVE FIRE is a fully comprehensive product, containing not only model carbohydrates but also the best stimulating and energising components to delay fatigue. We have added large and effective doses of the most important pre-training amino-acids to this supplement. L-Leucine, L-Valine and L-Isoleucine are biocompounds with branched chains (BCAA), which thanks to their unique structure do not require digestion and reach the muscles immediately. Their presence inhibits negative catabolic processes, which reduces the degradation of contractile proteins. BCAAs are also an alternative source of easily accessible energy, which is indispensable during long-term and intensive training. VITARGO ACTIVE FIRE also contains a readily soluble and easily accessible creatine formula. The creatine malate contained in the product supports the production of adenosine triphosphate (ATP), the basic carrier of energy necessary for fast and powerful muscle contractions. For them to have their full effect, you have to guarantee a high level of concentration and the quick transmission of nervous impulses. To that end, you will find two effective neurostimulators in VITARGO ACTIVE FIRE: pure Anhydrous Caffeine and Taurine. These two substances generate a stimulating synergy effect which mobilises the body to undertake effort. In contrast to the caffeine we drink in coffee or tea, the caffeine contained in VITARGO ACTIVE FIRE works much faster, does not burden the stomach and does not dehydrate the body. Taurine is a non-protein amino acid which serves as a framework for the synthesis of neurotransmitters, enabling better control over muscle contractions through the nervous system. In order to accelerate the absorption of VITARGO ACTIVE FIRE’s components, we added an innovative vegetable component, VINITROX™. This patented, natural grape and apple extract has unique properties. The polyphenol compounds not only protect the organism against the destructive activity of free radicals, but also stimulate the enzyme responsible for the production of nitric oxide (NO), which is located in the endothelial tissue cells in the vascular system. Its activity relaxes the vascular vessels’ muscles, which enables increased blood flow. VINITROX™ stimulates the blood flow to the muscle cells in a natural and safe manner. It accelerates the transport of oxygen in blood and all nutrients. The formula is completed by a mixture of the electrolyte compounds necessary during physical effort, as well as vitamins ensuring that the energy-producing processes take place properly. VITARGO ACTIVE FIRE is a perfect pre-training supplement recommended for all athletes. The formula contains the highest quality carbohydrates from 100% original VITARGO®, which supplies the body with a perfect fuel for prolonged and intensive work. The product’s active ingredients optimise all energy pathways, while the active neurostimulants help delay the first symptoms of fatigue. VITARGO ACTIVE FIRE is a complex solution for amateur and professional athletes, stimulating and motivating the entire body into making a real effort and helping maintain training intensity. This quickly translates into improved motivation and accelerates training improvement. Citric acid - acidity regulator, sucralose - sweetener; beta carotene - a color for the pineapple flavor; azorubine - a pigment for the grapefruit flavor. Aromas: grapefruit flavor for grapefruit flavor (Grapefruit Punch); pineapple flavor for the pineapple flavor (Fresh Pineapple).